If there was any question of who the leading voice of religious veganism belonged to, there certainly isn't any doubt these days. Asa Keisar easily took that crown when he rocketed onto the scene recently. Keisar has come to represent and define religious veganism to pretty much all of Israel these days. His superstar status eclipses anyone else, even well known American vegan luminaries. Keisar's latest YouTube video lecture of ten minutes just flew past one million Israeli views in less than ninety days. That's pretty astounding given that it's in Hebrew. When he puts out a video, Keisar is one of a tiny handful of Israelis who can actually speak to the entire nation. 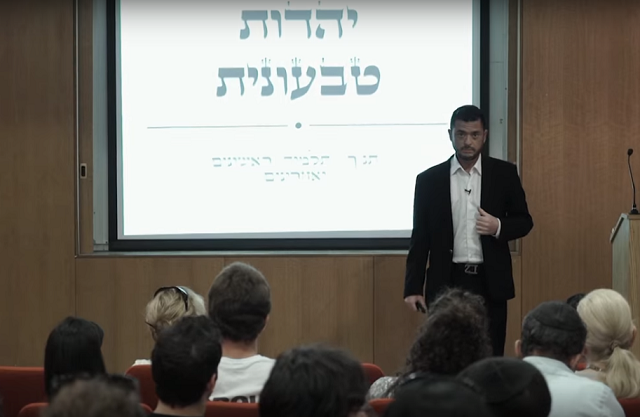 A million Israeli viewers on YouTube, with most of them having watched his entire lecture, means he is able to speak to one out of three Jewish Israeli adults. That puts him in the company of a very rarified group. People who by dint of their position are able to speak to the nation and hold their attention. Bibi, for example. But of course he's the Prime Minister. Keisar, however, holds no position or office. No matter, his star power is clear. Today religious veganism, and just regular veganism, has a voice like never before. A voice that the public adores. That voice belongs to Keisar. And this voice is defining veganism and morality for an entire country. This is something not seen before. This is something very big.